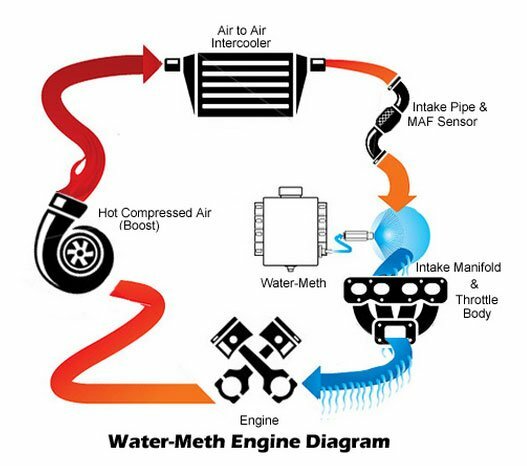 First of all, a water methanol injection system is basically a cohesive package typically containing a controller, pump, and reservoir that sends a highly pressurized water-methanol mixture into your intake manifold to aid in the combustion process. It features a fully automated system that monitors boost levels, throttle position, and numerous other factors to determine timing and duration of fluid injection. But why? Methanol is a very efficient combustible, especially when mixed with diesel at high pressure in the combustion chamber. In essence, it assists in burning off a large remainder of the unburnt fuel in the cylinders that typically gets wasted into heat energy, and transforming it into power energy. Further, water is used to lower the cylinder temperatures, which in turn causes lower exhaust gas temperatures, something that the 5.0L Cummins fight even in stock form. Obviously, this is very different than the urea injection that modern era diesels come from the factory with, as this is merely an injection event that occurs in the exhaust system to aid in keeping the emissions devices clean of particulate matter (soot). But funny enough, water methanol injection does assist in reducing particulate matter, as it causes a more complete burn of the fuel, i.e. raising the efficiency of the engine. As far as the question regarding washer fluid. Well, yes, its somewhat true that many will use high quality washer fluids as they are essentially a 70/30 water-methanol blend. However, we always recommend using certified blends to avoid any potential issues. Expect an increase in power, a jump in fuel economy, and reduced exhaust gas temperatures (EGT's) with the installation of a water-methanol injection system.